Create complete reports in Excel and CSV format. Use our API to retrieve your data from your tools. Optimize the activity of your company. Manage the planning of your human and material resources from Internet. With Netside Planning, facilitate the planning management of your company. Plan in real-time and simultaneously the activity of your human and material resources from a simple Internet browser. From our secured interface and directly accessible from Internet, manage your staff member's planning from anywhere. 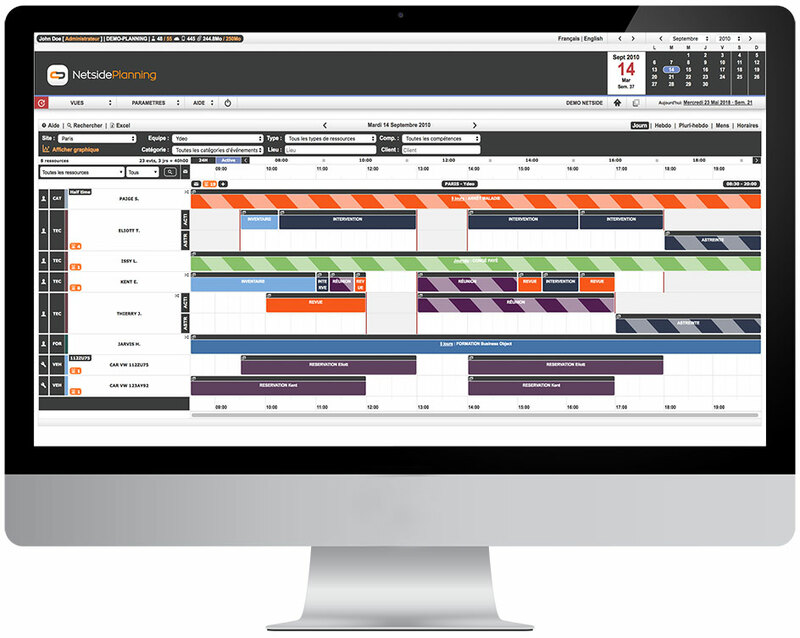 Netside Planning has been designed to be usable quickly by all your teams whatever their job. Forget the softwares too complicated. Only a few minutes are enough to take in hand Netside Planning. View and schedule your company activity with daily, weekly, multi-weekly, monthly and calendar schedules. Create and modify your schedule tasks simultaneously. Centralize activity, interventions, holidays, absences and appointments. Book your meeting rooms and vehicles. Define multiple participants for your events. Your data is centralized and shareable with all your collaborators. Set the access and modification rights to the schedule. Interact and communicate in real time with your teams. Define automatic reminders by email or SMS before starting a task. Alert your teams in real time when modifying their schedule. Want to keep track of your offline schedules? All schedules are exportable in EXCEL format in one click and already preformatted for paper printing. With the mobility pack, your employees can follow their schedule in real time from their smartphone or tablet. But that's not all, all schedules can also be exported to Outlook or any other desktop calendaring application. Netside Planning allows you to create tasks waiting for planning. A dedicated view allows you to track the list of these events by resources and by teams. You can integrate one or more attachments into your schedule tasks. 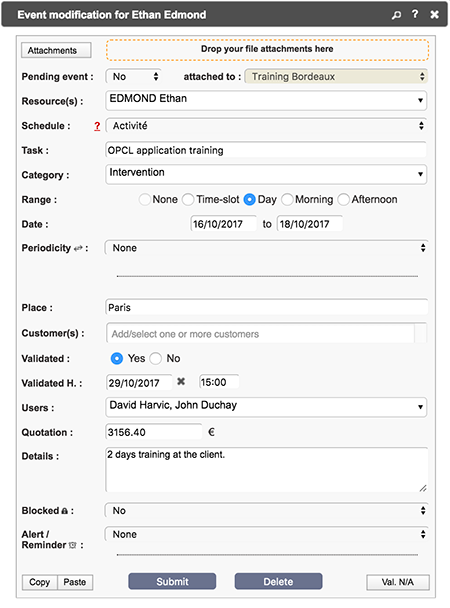 With this feature you can attach quotes, technical documents, photos or any other document useful for your interventions. Netside Planning displays public holidays from more than ten different countries. The creation of vacation schedules and absence schedules for your employees is facilitated. We offer a QR code clocking system to record your employees' time schedules in real time and at a lower cost. Print these QR codes at your customers and your employees will only have to point directly to their smartphone. Track these time slots in the app and easily create reports on worked hours and overtime. An search engine allows you to find your tasks and events very easily. Many reports, statistics, and charts are available in the app. All our reports are again accessible in one click and exportable in different formats (EXCEL, CSV, JSON). Customize the application as you wish. Try Netside Planning for free for several weeks. No commitment, no CB request and no application to install. Your personal schedule is accessible in few minutes. 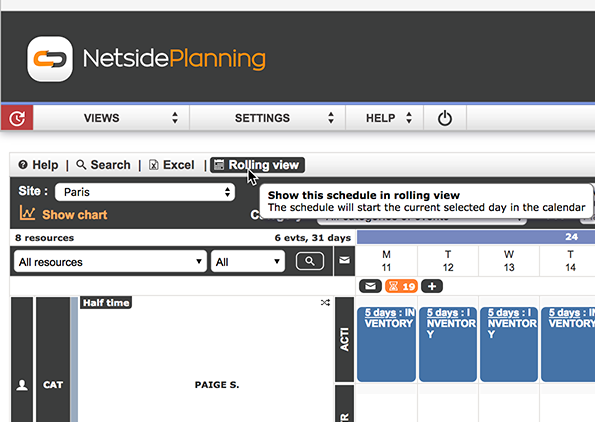 Netside Planning version 3.00 is now online. New interface, new time clock QR codes and new rolling view. Optional fields typed, redesign of the event search engine and performance optimization.